Guidelines for placing concrete in cold weather. Frozen ground-NEVER place concrete on frozen ground or onto ice or snow. There are a couple of problems with this. First, frozen ground will settle when it thaws, cracking the concrete. Second, when the ground is cold, the concrete in contact with it will be cold and will set more slowly. You can even get crusting, with the top part of the concrete set and the bottom still soft. 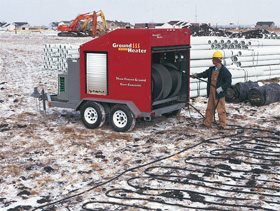 If the ground is frozen, you can thaw it using hydronic heat pipes and blankets (such as those from Ground Heaters), or electric blankets (check out Power Blanket). Remove all snow and ice in areas where concrete is to be placed. Also remove any standing water that could get mixed into the concrete. Warm up anything that will come in contact with the concrete, including forms and any embedments, to at least 32°F. If it's not too cold and you cover everything with tarps the day before the pour, it will stay dry and warm enough. Keep tools in your truck or trailer. Be ready with blankets, even if you don't think it will get that cold. Also consider whether you will need lights if the concrete sets more slowly than expected and the winter sun sets just as you're finally ready to start finishing. Natural Finish Countertop, Amery, WI Photo by Branson Interiors. There will be some heat loss from the ready mix plant to the job site. For a one-hour delivery time, the concrete temperature will drop about one-fourth the difference between the air temperature and the concrete temperature. So if the concrete's 65°F and the air is 45°F, in one-hour of travel it will drop 5°F and the concrete will end up at 60°F. 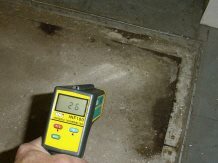 Keep a dial pocket thermometer or an infrared thermometer to test the concrete temperature. Remember that you need to keep it above 50°F for the concrete to keep gaining strength. Gabriel Ojeda with Fritz-Pak suggests that contractors keep work notes on the temperature of the air, the temperature of the concrete and how everything worked. This will serve as a good reminder of what to do in a given situation. On exterior concrete, remind your customers to keep deicing chemicals off the surface during the first winter. Deicers can lead to spalling of newer concrete. Don't use calcium chloride accelerators, since that will give the concrete a mottled, milky appearance. "We are very sensitive to color changes," said Dan Dorfmueller with Patterned Concrete of Cincinnati. "If we start with one mix we wouldn't change until the job is over, unless we can find a place where the two aren't touching. With colored concrete even the time of the season can change the way it looks. That's why the manufacturers all have colored cures or waxes to help blend the colors a little bit." "With stamped concrete we don't have too much trouble in the cold," said Dorfmueller, "because we can lay powdered release agent and as long as the blanket doesn't scratch the surface, you're good to go. But sealers are a problem. If it's too cold you're going to have to wait until spring to clean it off and seal it." Chris Sullivan, QC Products, also recommends the release powder approach and notes that this can also work with liquid release. "Wait until the liquid release has evaporated, then liberally dust the surface with a colorless release powder right before putting down the blankets." For more on this see "Preventing Water Stains When Using Curing Blankets." "Those who choose to seal concrete at temperatures below 50°F increase their risk of failure substantially," said Sullivan. 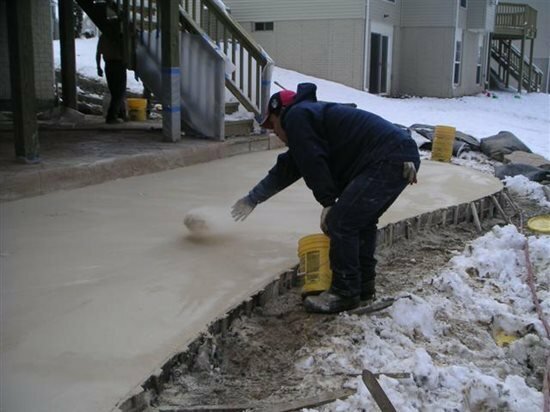 For tips on using sealers at or close to 50°F, see "Sealing Concrete in Cold Weather." Using curing blankets on colored concrete is difficult without getting a mottled appearance. John Buteyn, Colorado Hardscapes, suggests the following: "First off, it's good to have some barrier between the blankets and the regular concrete. For example, we have had success with a consistent coat of curing material--a clear cure. Second, sometimes we will put down one or two layers of landscape fabric and then put the blankets over that. 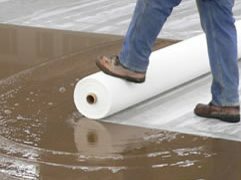 It's keeping a breathable membrane between the concrete and the plastic of the blanket. Third, if it is just getting cold at night then is getting over 40°F during the day, we will uncover the concrete during the day, pull the blankets off and let it air out and breathe then cover it again at night. Sure it adds to our cost but we are trying to protect the appearance of the concrete. One last thing that can help, depending on the temperature, anytime you have plastic or blankets, when you uncover the slab immediately do a rinse of the entire slab surface, before it dries. If you can rinse it off it helps to reduce that white discoloration from the blankets." 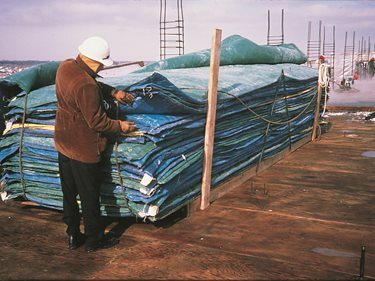 For keeping the surface of colored concrete wet and warm, you might also try the curing blankets made by PNA or McTech Group then cover with insulating blankets. These blankets maintain constant dampness on the surface and therefore are less likely to cause mottling. "You can't really do staining outside in cold weather because it would freeze," said Dorfmueller. "But one thing to watch out for with indoor staining is carbonated surfaces from heaters or equipment. We had a job where we stained the floor and when we rinsed it all the stain came off because the surface was so chalky." Set delay can really hurt your profits if guys are waiting for set in order to finish, therefore it is probably more economical to pay for cold weather concreting procedures than to try to wait it out. With concrete in forms, slower set can mean higher form pressures, so be careful about pour rates. In cold weather, "Although it can take longer to get to the stamping window," said Gabriel Ojeda, "the window is bigger."